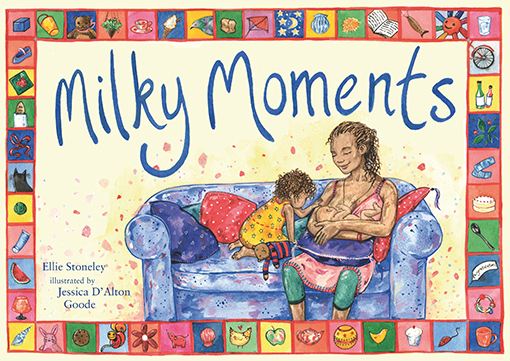 Milky Moments is a beautiful rhyming picture book for children and their families. Written by Ellie Stoneley, the book tells stories of family life and depicts breastfeeding as a very normal part of it. With hand painted illustrations by Jessica D’Alton Goode, Milky Moments was published in May 2015 by Pinter and Martin. The first print run sold out, and the book is now available worldwide on every major book site online and from many independent (and chain booksellers). Milky Moments received a warm welcome from parents, children and healthcare professionals and only 5 star reviews from around the world. 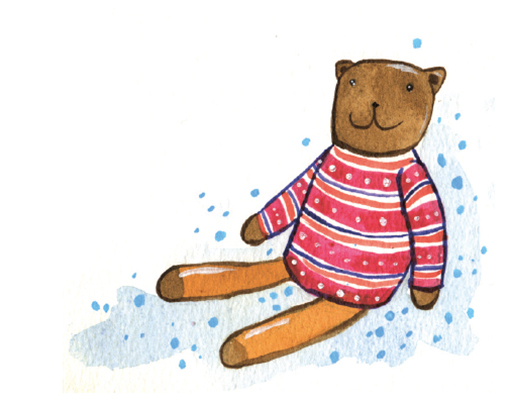 Cards and limited edition signed and numbered prints are now for sale on this site, along with a numbered collectable knitted bear called Eric (he stars in the book), and collectable felted nursing dolls. You can also find you all you need to know about buying a copy of Milky Moments on this website. Milky Moments has won an award. A huge massive enormous (and very prestigious … and voted for by the public) award. Voting for the 2015/16 Children’s book of the year in the prestigious People’s Book Prize is now open … until the day of the award ceremony on 12th July. Please do consider voting, and telling everyone you know to, for Milky Moments. 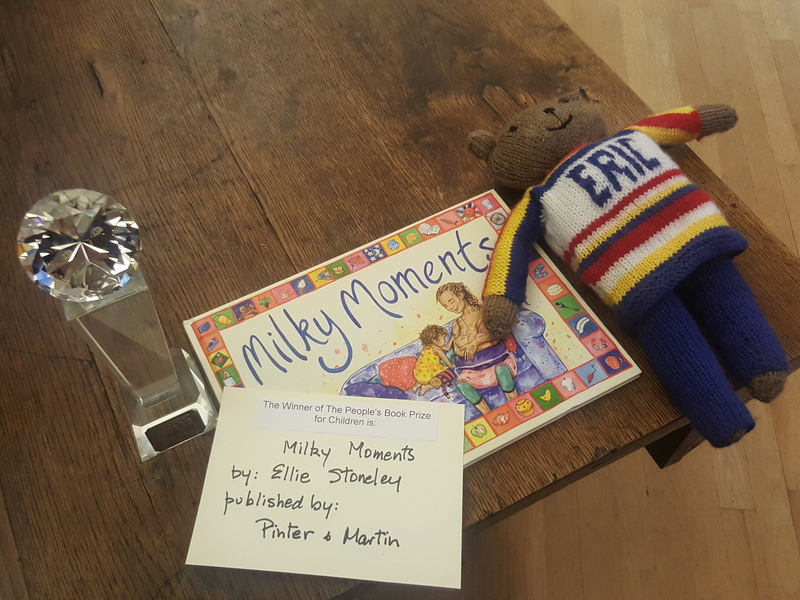 Milky Moments WON the Children’s Book of the Year award at the prestigious People’s Book Prize. This is hugely exciting. The winners are chosen entirely by public vote, which makes the award all the more wonderful and very humbling!! Hurrah! Thank you! and oh my word, it’s so important for a little rhyming picture book for children depicting daily family life with breastfeeding as just a normal part of what goes on. The awards were broadcast by Sky TV and were hosted by Sir Frederick Forsyth, Ellie and Jessica both attended and were totally overwhelmed to win. Milky Moments shared a post. Just cos...Sabai is almost too tall to feed from mum Thong Dee and sometimes nurses laying down like this. Sabai's brother Luk Chai used to nurse like this too! Elephant calves will generally nurse until approximately 3 - 4 years old. www.babymilkaction.org/tigers and then on until 4th June, often with panel interviews with actors and writers or people who are portrayed in the film. TIGERS is highly relevant for all those concerned about uncontrolled corporate power and malpractice, its impact on health and the struggle to get the truth out to the public. Good positioning and attachment is important for maintaining milk production. A baby who attaches deeply at the breast is able to remove milk effectively. 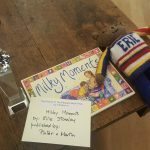 To celebrate #WorldBookDay how about winning a signed copy of Milky Moments? Simply write a few words about your / your partner's favourite, funniest, most meaningful breastfeeding moment and at midday tomorrow (8th March) a winning entry will be chosen at random. Practical tips to get you through your breastfeeding challenges. I'm pretty sure this is only the TED talk ever with 100 photographs of breasts, 100 photographs of penises and 100 photographs of vulvas. Honest, sensitive photography and in depth interview in search of what it means to be a man or a woman, exploding all the taboos on the way. “the words capture everything I’ve ever wanted to tell my children about breastfeeding” – Claire, mother of two. At home, in hospital or out and about, every beautifully illustrated scene tells a story about day-to-day family life and loving milky moments. Heart-warming, enchanting and fun, with a small bear called Eric to find on every page, this is a book to treasure that children will love to explore time and again. With careful attention paid to positioning, Milky Moments also gently educates and informs about breastfeeding, whatever your age.